Free Printable Adult Coloring Pages - Adults are allowed to color too! This is our collection of adult coloring pages. This is a great category because adults are allowed to color too! There are abstract and complex patterns included in this series. Printables are great because you get to choose the type of paper. Do you want to try coloring the designs a different way? You certainly can...just print it again! This category is so popular that we decided to make a new website called PaintSpring featuring printable adult coloring books. Every PaintSpring high-resolution PDF coloring book includes 3 free adult coloring pages that you can download right now. All of the adult coloring printables have been optimized for easy printing. Select the adult coloring page you would like to color. This will take you to the corresponding web page. Then you will have two options. I recommend downloading the PDF files of the adult coloring pages you choose to color. This will produce optimal results in terms of print quality. PDF files can be easily opened and printed using several free programs. The other print option available to you is printing directly from your browser. 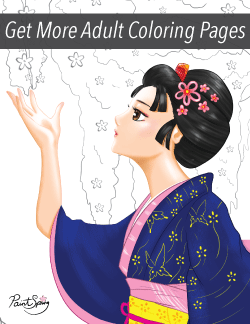 This is the fastest way to print the coloring pages but the quality will not be as good as the PDF version. These adult coloring pages are a great activity for teachers, parents, and kids. They are best suited for elementary students.